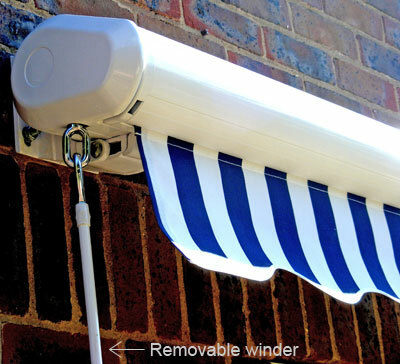 At The Awning Man, we stock Full Cassette Awnings that can be manually operated by using a winder handle or electrically controlled by switch, remote control or weather sensor. Our Full Cassette Awnings retract into a casing which completely covers the fabric, protecting it from the elements. The integrated gutter in the front bar also allows water to run off easily. 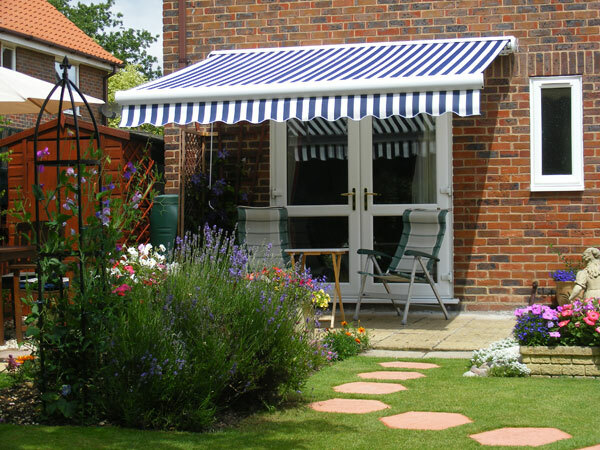 The Full Cassette Awnings are available in a variety of colours, both solid plain and striped, and are made from high quality, waterproof 300gsm (grams per square metre) polyester, perfect for use as garden, shop fronts and patio awnings. The awnings come complete with all necessary expansion bolts and wall brackets. If you've ordered a manual full cassette awning, the awning will be provided with a winder handle to manually operate it. For the electric awnings, you choose on the awning product page which electric control you would like to purchase to operate the awning, though you will also be supplied with a winder handle to manually operate the awning. The full cassette awning can be opened as much or as little as you like up to the maximum projection and you can alter the slope of the awning from almost horizontal to a relatively steep tilt of approximately 30 degrees from the horizontal. Electronically operated Blue Stripe Full Cassette Awning Width 3 metres with a projection of ..
Manually operated Blue Stripe Full Cassette Awning Width 3 metres with a projection of 2.5 me..
Electronically operated Blue and White Stripe Full Cassette Awning Width 2.5 metres with a pr..
Manually operated Blue and White Stripe Full Cassette Awning Width 2.5 metres with a projecti..
Electronically operated Blue and White Stripe Full Cassette Awning Width 2 metres with a proj..
Manually operated Blue and White Stripe Full Cassette Awning Width 2 metres with a projection..
Electronically operated Blue and White Stripe Full Cassette Awning Width 3.5 metres with a pr..
Manually operated Blue and White Stripe Full Cassette Awning Width 3.5 metres with a projecti..
Electronically operated Blue and White Stripe Full Cassette Awning Width 3 metres with a proj..
Manually operated Blue and White Stripe Full Cassette Awning Width 3 metres with a projection..
Electronically operated Blue and White Stripe Full Cassette Awning Width 4.5 metres with a pr..
Manually operated Blue and White Stripe Full Cassette Awning Width 4.5 metres with a projecti..
Electronically operated Blue and White Stripe Full Cassette Awning Width 4 metres with a proj..
Manually operated Blue and White Stripe Full Cassette Awning Width 4 metres with a projection..
Electronically operated Blue and White Stripe Full Cassette Awning Width 5 metres with a proj..